Like many writers, I have a lot of books. One of my favorite social activities is going to a friend's book signing and buying their fabulous book. I also love keeping up with the newly published children's and young adult offerings and buying those amazing books. This leads to a problem—the danger of being swallowed up by books. Even if I buy some books in eBook format, I find myself wanting to share my favorite books. If I love a book, I want to give it to a kid or teen that will enjoy it. Amazing books should be read – not hoarded on an eReader. Also, because of health issues, I haven’t been able to eat candy for the past five years. So I was feeling weird giving out something on Halloween that made me so ill. Plus, I couldn’t eat the leftovers but didn’t want to throw them away either. One day I read a Facebook post where someone mentioned giving out books for Halloween, instead of candy. I instantly knew this was something I wanted to do! 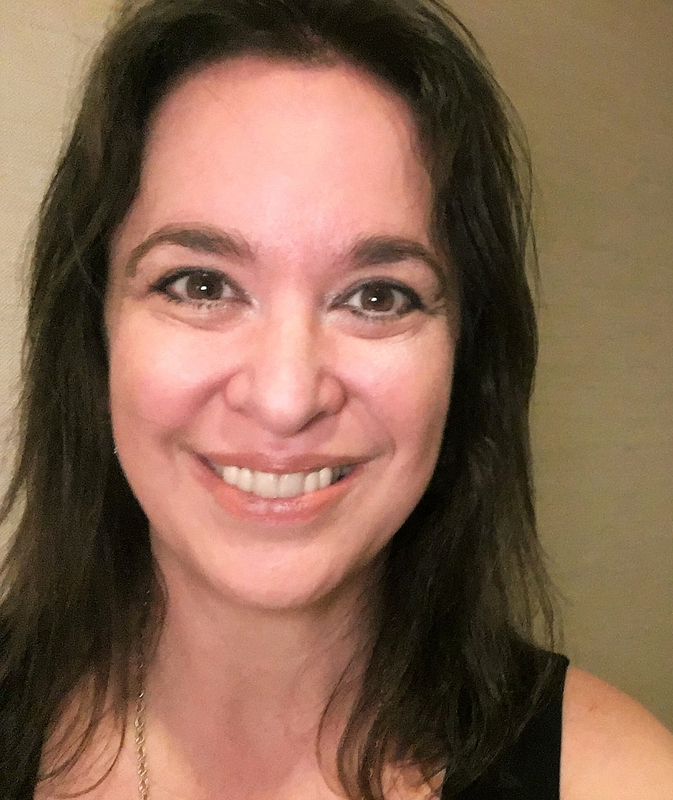 Giving out books was the perfect solution for me, combining all the things I love: books, sharing good books with kids and teens, and dressing up for Halloween. Instead of having the author write a note to me, I explain my Halloween book project at the signing and have the author write Happy Halloween on the title page. 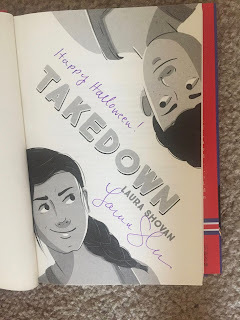 This way a child gets a signed book from an author that celebrates the fact that they acquired the book on Halloween. It also makes for a fun conversation with the author at the signing. Buying lots of books at book signings can get expensive, so to supplement my book supply I turned to local used-book sales. My local high school has an annual used-book sale in March. On the last day of the sale they sell a bag of books for $10 dollars. Now I stock up for Halloween books in March. My library also has its own on-going Friends of the Library used-book sale on a couple of shelves in the library branch near me. They also run a couple used-book stores in nearby towns. I was able to round out books in the age levels that I was missing at those stores. Now that I had a solid book supply, I was ready to figure out the Halloween details. I decided I would dress up as a witch to give out books since I already had a witch costume. It was hard to predict how many kids might come to my block on Halloween though. Some years we’ve had a good number of kids and other years we’ve had only a few. To encourage more kids to venture to my block, I decided to do a little pre-Halloween advertising. On October first I put up a countdown sign. I used the frame from an old political sign and covered it with a pillowcase (slit at the bottom) that I decorated using sharpies. Each day I changed the number on my countdown with tape covered Post-it notes. This way word of mouth could spread and I would be sure at least a few kids would come to my house. It also made me commit to the project so I wouldn't back out. 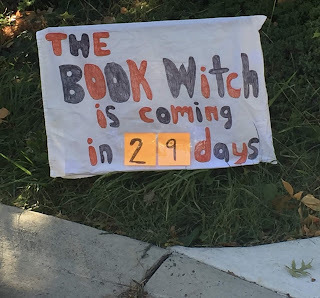 On Halloween day I changed the sign to say the Book Witch is coming from 6:30 a.m. to 9:30 p.m. I bought Halloween-themed lights, a cauldron, and other props in October. I also looked over my collection to make sure that I had a good selection of picture books and novels. My spouse suggested using hay bales as a way to display the books. On Halloween day, he moved the car to the street and set up the hay bales on the driveway. I set up the books in piles on and around the hay, changed into my costume and was ready to be the Book Witch. The kids and parents who came to my house loved this idea! I had just one kid who told me they didn’t “do books,” even graphic novels. Most kids were thrilled to get to pick out a book, though, and even more excited when I showed them books by local authors. At the end of the night, I brought the few leftover books back inside, washed my costume, and packed up all my props. I put everything in a box labeled “The Book Witch” so it would be easier to do the project again the next year. Last year, I also didn’t take any inventory ahead of time, so I had no idea how many books I gave out. I was afraid if I made the project too time consuming I’d never actually do it. So I was glad I didn’t make a list the first year. I ran out of novels midway through the night, though, because kids tend to trick-or-treat in my neighborhood until ninth or tenth grade. Turns out there is a big need for novels in my area, which I think is terrific! This year I plan to create a list of all the books I give out and will check off what’s left at the end of the night. That way I’ll have a better feel for what books I’ll need next year. I feel up to that challenge this year, since I’ve already done the project once, and know how much fun the night will be. A couple of writing friends have mentioned fun twists on my Book Witch idea. Laurel Abell suggested being a Book Fairy. 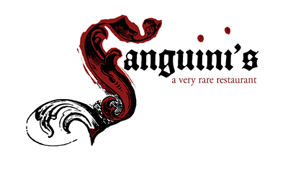 Angele McQuade suggested setting up a haunted library and being either a ghost or zombie librarian. She wants to have some adult books for interested parents, too, and possibly also bookmarks/swag from author friends, We Need Diverse Books, and other bookish resources. I love all these ideas and can’t wait to see a sea of photos on social media of the many, many types of Halloween book projects out there this year, and in the years to come!